It has been said that St. Louis has the best baseball fans in the country. I happen to believe that is true, not just because I live here, but because I've seen proof of this many times. For example, we congratulate fans of the opposing team, even when our loss truly hurts (i.e. the 2004 World Series). We Cardinal fans also tolerate the obnoxious Cub fans and refrain from pouring beer on their sorry little heads...hee hee hee. I could go on and on but you get the idea. What we experienced today is another example of how great Cardinal fans are. We had tickets for the Cards/Nationals game. It was raining and the prospect of the Cardinals actually being able to play didn't look very promising. We entered the stadium and were collapsing our umbrellas when an older lady approached us and asked if we were by ourselves. We told her that we were and she then said that she had two Party Room tickets and they were ours if we wanted them. We were shocked at first and then accepted the tickets and thanked her profusely. Party Room tickets are $110 a piece! Party Rooms include seats that are covered, an indoor area that is heated/cooled, and all the food, soda and beer you can consume. Anyway, the lady and her brother were supposed to enjoy the game with friends but, at the last minute, the friends were unable attend. The lady told Bill that she didn't want the tickets to go to waste and that she wanted someone nice to use them! We asked for her name and address when the game was over but she declined and said that she was just glad that we enjoyed ourselves. Believe it or not, there was no rain delay. The rain magically stopped about 15 minutes before the start of the game. We won the game, by the way, thanks to an 8th inning home run by Albert Pujols. Jason Isringhausen entered the game in the ninth and we collectively held our breath. He walked three batters in a row and, needless to say, the fans were not happy! There's always drama when Izzy pitches. Tony should only allow him to pitch when we're ahead by at least five runs. After the game, we ate an early dinner at Morgan Street Brewery. It was a great day! I especially enjoy $40 a Day and Tasty Travels. When we were in Las Vegas last June, we noticed a film crew in one of the restaurants in the Wynn hotel. I noticed a notebook in the hands of one of the crew. The cover read "Rachel Ray's Tasty Travels." I figured that she had to be somewhere close by. About 5 minutes later, I noticed a woman with sunglasses on and, sure enough, it was Rachel. I didn't ask her for her autograph or even approach her for that matter. It was just cool to see her in person. We have some really great restaurants in St. Louis and I kept hoping that she would eventually tape an episode here. Much to my delight, about three months ago, I learned that she had been in town taping an episode for Tasty Travels. That episode will air Friday night on the Food Network at 8:30pm central time. Rachel is making a return visit to St. Louis on May 21 to sign her newest book. I'll definitely be there and this time, I'll ask for an autograph! I'm beginning to think that I'm a jinx when it comes to the Cardinals. The Cardinal's record in the new stadium is 6 and 3 and we've seen two of the three losses! Oh well, it was still a good game. The Cardinals never give up, even when they're down 7 to 1 in the ninth! They came back for two more runs for a final of 7 to 3. A fellow Cardinal fan sitting two rows in front of us was wearing a Cubs jersey but, instead of a player name and number on the back, printed in red was "Sucking since 1908." He was able to wear it until the second inning when one of the ushers decided that it wasn't "family friendly." He took it off and had a Cardinal tee-shirt underneath. In the ninth inning, he draped the jersey on his back for everyone to see . The Cards fans immediately cheered, much to the consternation of the Cubs fans. Another usher then told the fan to put the shirt away saying something like it didn't foster good relations for the friendly rivalry between the Cards and Cubs. Rivalry, yes...friendly, I'm not too sure! Here's hoping that next Saturday's game against the Nationals has a more favorable ending! I bottled my steam lager today (batch #06-02-14). The 48 bottles are currently in the carbonation room where they will remain for approximately two weeks before being transferred to the cooling room (basement) and then to the refrigerator. Steam lager is a lager that is fermented at a higher ale temperature. Anchor Steam Lager (Anchor Brewing) is well known steam lager. I also washed and waxed my car today. It was so nice to get rid of the winter grime. My Miata is now ready for top-down weather! We were lucky enough to obtain tickets for the Cards/Cubs game tomorrow. The Cards beat the Cubs yesterday and today so I'm hoping for a sweep! 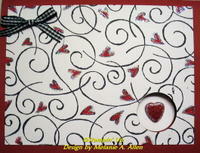 I used Real Red card stock and then stamped a piece of white card stock with the Soft Swirls background in black ink. I then colored in all of the hearts and added dazzling diamonds glitter around the edges of each one. I embossed the gold heart pin with red embossing powder and then added dazzling diamonds around the edge to mirror the hearts on the card. I punched a circle on the lower left front of the card and attached the pin to the inside so that it peeks out through the circle. I added a black gingham bow as a finishing touch. It is somewhat difficult to capture the full effect of the glitter in a photo. I tried scanning the card but I wasn't pleased with the results. I then took about 20 digital photos of the card using different lighting and finally found on that I liked. In order to more clearly see the details of this card, including the glitter and the heart pin, click on the photo. I am also working on another card design using the heart pin. I need to purchase gold cord and gold detail embossing powder in order to finish the design. I'll be sure to post it once it's finished. We went to our first game at the new Busch Stadium last night. It was the Cards vs the Reds. The Cards lost 1 to 0, unfortunately, but it was still a great game. Everyone seemed so excited to be there. The temperature was unseasonably warm. Believe it or not, it was 49 degrees warmer yesterday than it was went we visited the Stadium last Saturday. The high was 92 degrees which set a record. In fact, the low temperature for the day was actually higher than the normal high for the day! It felt like June but with a lot less humidity. 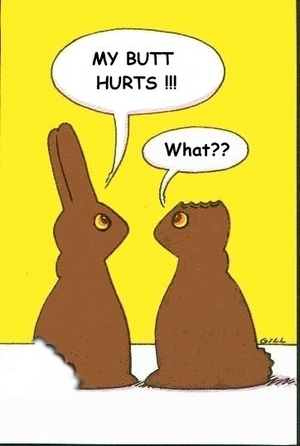 I originally received this cartoon in an e-mail about 7 or 8 years ago and I saved a copy. I laugh every time I see it. My dad, Bill and I went to the Busch Stadium open house yesterday. It was a nice, sunny day although it was a little chilly (43 degrees). The sun was warm, though, and we didn't really even notice the chill because we were too busy taking in all the sights. First of all, the view in the stadium is great. Unlike the view in the old Busch Stadium, you can now actually see the Arch. I wasn't sure that I was going to like the open feeling of this new stadium but it's very impressive. Needless to say, there are quite a few places to buy refreshments. In addition to the regular ballpark fare, you can buy salads, stone baked pizzas, gourmet cakes and desserts, and portabello fries. I tried a Fireball Burger which is a hamburger with nacho cheese sauce and jalapenos. Quite tasty! We found the seats in which we'll be sitting for 4 games. Our first game is Friday, April 14. If the weather is still chilly, we'll definitely need to wear sweaters, jackets, etc. as there seems to be a lot more breeze here in this open stadium than there was in the old stadium. We spent the entire three hours of the open house at the stadium. We then went to Ellie Forcella's (update - no longer in business; closed 6/30/06) for dinner with my parents. It was a great day! Yippee! It's Friday. For some reason, it seemed like an extremely long week. I'm just glad it's Friday. We usually go out to dinner on Friday night but they were predicting severe weather again (including hail) so we decided to stay home. I had Moxied (Charter Cable's version of Tivo) Marathon Man about a month ago and we finally watched it tonight. This movie is 30 years old but, believe it or not, I had never seen it. It was actually a pretty good movie; much better than I thought it was going to be. Now I know what the line "Is it safe" means! We're going to the Busch Stadium open house tomorrow. I'll be sure to take a lot of pictures and post at least a few here on my blog. For those of you who are not into stamping, you might find this post a little boring today. I try to alternate between my various areas of interest so that everyone is equally bored. :) Anyway, I've been working on a few new cards and I thought I'd share them with you. On the first card, it is somewhat difficult to see the sparkles but they're definitely there. If you click on the picture, you'll see a close-up view and the sparkles are much easier to see. I love sparkles; the more the better. I try to keep it toned down most of the time though. Anyway, I stamped the tag about a month ago using Brocade Blue ink on vellum. I embossed it with Iridescent Ice embossing powder and then attached the vellum to card stock and used the Stampin' Up tag punch. After this was finished, I wasn't really sure what I wanted to do with it so the tag sat on my stamping desk for a while. A few days ago, I decided to stamp the Sparkle background (that's the actual name of the stamp; maybe that's why I like it so much) in Brocode Blue and then add a few dots from one of my sparkle gel pens. I attached a piece of organdy ribbon with a fastenater which is one of my new toys. It's like a stapler except that it uses metal bars instead of staples. I then attached the tag with a dimensional so that it was raised rather than flat against the background. The background was then mounted on Whisper White card stock. 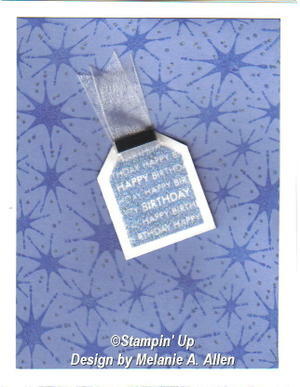 This second card was made for a demo swap on Splitcoaststampers.com. One of the requirements was to use the On the Spot background or Sweet Spot stamp set. I used both and then stamped "Thank You" from the Alphabet Soup set. I used Tempting Turquoise and Cameo Coral. I must say that Cameo Coral is probably my least favorite of the 48 Stampin' Up colors but it looks great with the turquoise. I added brads and ribbon as embellishments. Now I need to make 5 more of the same card for the swap.